The point being, you will know these cards and might care about them more than if I’d made them up. Now, here we have a man whose appearance means that God destroys EVERYTHING (some restrictions apply). Technically, no one in the Bible has powers – God just tells them He’ll do it, as happens here. God says his creation, Mankind, has gone terrible and evil, so every human but Noah and his 3 married sons dies, every animal except the loving couples on the Ark dies, and all the land on the planet is underwater. Now in Magic: the Gathering, this has some potential. Come on. You know Planeswalkers are ridiculously overpowered. 1) First all the animals are called to him by species in pairs. They just show up, from everywhere. 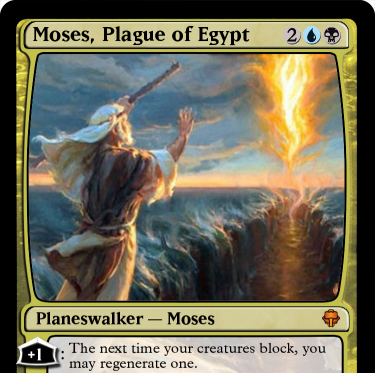 Now, every Planeswalker needs an only-slightly-ridiculously-powerful ability which actually gives it more Loyalty points. It does something good for you AND lets you save up for a finisher move for later. “Search your deck for any creature and play it”? With or without costs, that on its own would be incredible. So much of Magic is spent hoping to get a creature you could really use right now. Let’s tame it a bit, though. Just remember you’ll drown everything later and you’ll feel better about settling here. Let’s look into the 2 by 2 thing. It says 2 of every Creature, not 2 of every specific individually-named card kind of creature. Let’s work with what you have a bit. If you have some kind of Bear, or Griffin, can you search your deck for another of that and assume they’re ready for a relationship right now? Sure! But wait a minute. Is this just for animals? Where do Humanoids and Sentient non-humanoids fit in all this? If Noah lived with Elves & Goblins, would he have saved them? Well, luckily, Magic has a meticulous, retroactive answer to that: they call it “the Race/Class model.” You just have to look it up because the cards only sort of answer this. Years after throwing the word “Human” or “Soldier” or “Cat” on a card as a “Subtype”, they made a list. Humanoids like Humans & Elves went in one group. Humanoids who weren’t really human but just look like it, say, “Angel,” got another. Sentient creatures who don’t look like us, like “Demons” and “Dragons” and a lot of subtypes they made up, get the land. Most of these can have jobs, called a Class, like “Wizard” or “Scout”. This word shows up after the first word, so they have two subtypes, but you have to infer that the first is a Race and the second is a Class based on context. So, no, just because you have one Wizard doesn’t mean Noah needs a second. Everyone I just mentioned is Sentient, no matter what they look like – that’s their distinction. The rest is Animals like “Snake” and Phantastical Animals like “Hydra,” and plants and everyone’s stopped caring by this sentence, oh you’re reading it? Why thank you. Long story short – an ark probably needs 2 of every Race. Just not 2 of every Class. 2) Then there’s the flood. Destroy all nonblue creatures without flying? See that’s what I thought. (To be fair I put that idea in your head just now.) Nope, yours had a boat. That was the point of having an Ark. But to be fair, they had to be in pairs, or you’d have no more species to play except those, forever. Wherever summoned creatures come from, let’s assume it’s on this plane, and you have the only ones left. Can you imagine gameplay after that? “Create an emblem that reads: “You get an Emblem with: “Creatures with subtypes other than (those on the battlefield when this Emblem was made” cannot be played.”” … “plus Humans.” I guess we can throw them a bone. Nah, I don’t hate people enough to do that. Magic is brutal, but I don’t like frustrating people with technicalities. A power like that makes them lose hope. Emblems are forever, and if they don’t have the same Creature types as you, you’ll just attack them til they die, and that’s a bland way to go. “-10: Destroy all nonblue creatures which have only one of their creature subtypes in play. Nonblue creatures cannot be played until the end of your next turn. Flying creatures unaffected. 2x: destroy all opponents’ nonblue creatures without Flying and with Toughness X or fewer. BAM. They may be able to rebuild, but they’ll be eking out an existence on meager early-game levels of mana for a while. And to be fair, if you had a multicolor deck, you may have returned a few too. There was a lot that wouldn’t make it into this Noah card. If everything floods, where is your opponent in all this? Is he floating magically, is he floating in a dinghy, is he stuck on the Ark… in the first two cases, would you be able to attack him directly? Didn’t the animals become dormant-ish to save energy for the flood, since they couldn’t possibly have packed enough food, and the predators would’ve eaten countless species to extinction before land came back? Now look, I think I’ve made it clear I care an incredible amount about making the Bible into a card game. But I’ve spent hours apiece on some of these cards (with ADHD only some of the time is actually spent on that card; most is spent on the others). The fine, finished product is its own reward. If there’s a place or forum to lay them out for people, point me in the right direction, ‘cause I am gonna be real busy stockpiling these. +1: Search your deck for a creature with the same race (subtype) as one on the battlefield; play it immediately, paying all costs. 2x: Destroy all opponents’ nonblue creatures without Flying and with Toughness X or fewer. Skip your next Combat Phase. -7: Return all nonblue land cards to their players’ hands.